This week we are showcasing some of the upcoming German Tanks. The Germans are getting five tanks; the Panzer IV (Long), Panzer IV (Short), Panzer III (Long), Panzer III (Short), and the Tiger. These tanks add a lot of new and interesting options. 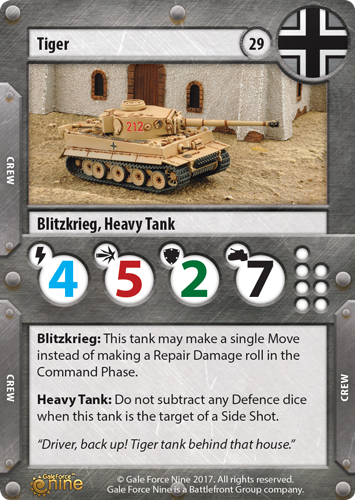 With these new Desert releases come two new Panzer IV tanks. The long and short of it, forgive the pun, is that these tanks are earlier renditions of the Panzer IV tank that is already available. As the desert war went on, increasing numbers of Panzer IV were armed with the long-barrelled 7.5cm KwK40, switching from an artillery support role to a heavy anti-tank support one. The Panzer IV (Long) is almost identical to the current tank but has less Damage Capacity making it cheaper. The short-barrelled Panzer IV was designed as an artillery support tank to back up the lighter Panzer III. It's heavy 7.5cm gun made it particularly useful against anti-tank guns. 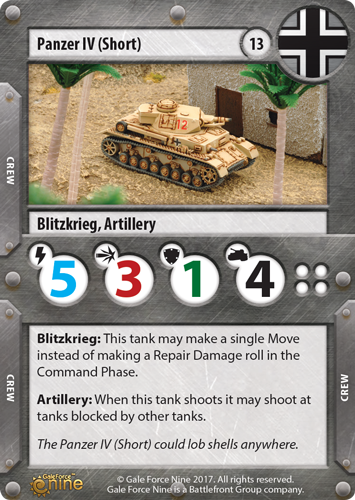 With the Panzer IV (Short), we have the introduction of a new rule, Artillery. This rule allows tanks to shoot “over” other tanks, but it is also a keyword that will be linked to other cards. The Artillery Observer is one such card. It lets a stationary tank draw its line of sight from another tank, hitting targets it normally couldn't see. Although the tank doing the spotting must give up its shooting to use this ability. These Panzer III tank models give the Germans some options for really cheap tanks. At 11 points you can get a really cheap tank in the Panzer III (Short). You can fit nine of these tanks into one list! For three more points you can up-gun to the Panzer III (Long) to gain +1 Attack on the tank, not bad at all. 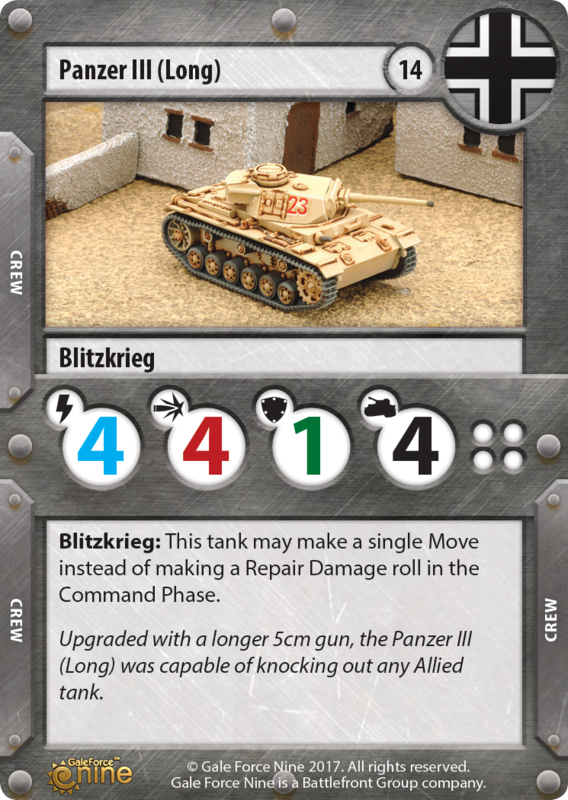 The Hero card in the Panzer III pack is the infamous Erwin Rommel. Coming in at 11 points Rommel gives his tank +3 Initiative, he also grants a once per turn re-roll of any one die rolled by anyone in the game. Because Rommel is such an important character if he is lost you actually give a Victory point to your opponent, this only comes into play in missions that your opponent can score Victory Points, but still it is a consideration when sending such an important leader into the fray. The Tiger was an interesting tank to design, as there is little to no difference in stats between the two Tigers but there were some striking differences in the models themselves. Nevertheless, we decided we wanted a desert Tiger and so we continued researching looking for any differences. In the end we decided that since this Tiger represents the earliest version we will make, that we would be content to lower its Initiative and Damage Capacity by one each and bring its points down to 29. This reflects the tankers inexperience with the Tiger and that the design continued to evolve and improve into the later production model already represented in TANKS. It also gave us a new interesting option for players to field. One of the most obvious differences between the Tiger tank models (other than the Zimerit) are the massive Desert Filters on the back of the tank. 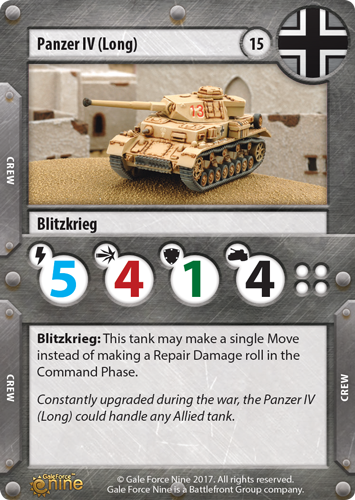 We wanted to showcase these in an upgrade that protected the engine of the Tiger tank, which gave us a new engine upgrade card, as there are few of those in the game presently. 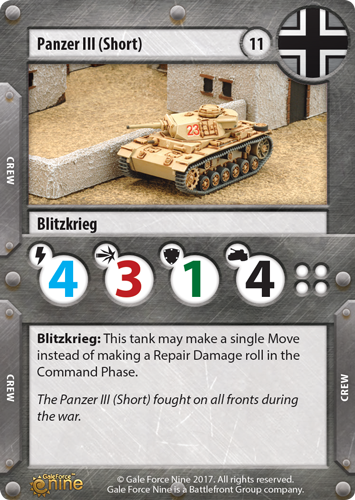 Make sure you check back next week as we look closer at the Panzer III and the Tiger and how you can create platoons using some of the new upgrades.